The study of protease inhibitors and carcinogenesis has aided in the identification of proteolytic enzymes in the regulation of cell growth, invasion, and metastasis. 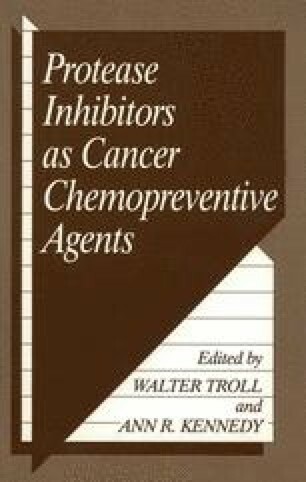 Since the early 1970s the value of protease inhibitors in the suppression of tumorigenesis has been demonstrated in a variety of tumors (Troll et al., 1970; Hozumi et al., 1972; Weed et al., 1985). The proteases, namely, plasminogen activator, plasmin, collagenase (Mignatti et al., 1986), and cathepsin D (Sloane et al., 1986), are primarily appreciated for their role in invasion and metastasis. However, Corasanti et al. (1982) have demonstrated that ε-aminocaproic acid suppresses dimethylhydrazine-induced colon tumors in mice, implicating a possible role for plasminogen activator in the mechanism of carcinogenesis. The control of intracellular protein turnover (Waxman et al., 1985; Hershko, 1988), the maturation of polypeptide precursors (Bathurst et al., 1987), the regulation of neutrophil activation (King et al., 1987), and the control of sister chromatid exchange (Kennedy et al., 1984) are several examples where proteases have been directly or indirectly implicated in cellular regulation.